There’s something special about text-based games. Maybe it’s because they’re reminiscent of the classic titles that helped form the industry back in the 70s and 80s, or because they require you to use your imagination; or, maybe, it's that text-based games happen to be some of the only titles that run well on my computer — but, I digress. Open Sorcery reaffirms the special nature of text-based games, managing to create an experience both classic and modern. Open Sorcery was developed by Abigail Corfman and published by Open Sorcery Games. It is a text-based title, similar to a "Choose Your Own Adventure" (CYOA), with RPG elements. You control an Elemental Firewall program (a combination of magic and technology), named BEL/S, and its primary function is to protect various networks of people. You do this by seeking out and eliminating threats, which are spirits, each with unique "matter" and "motive." 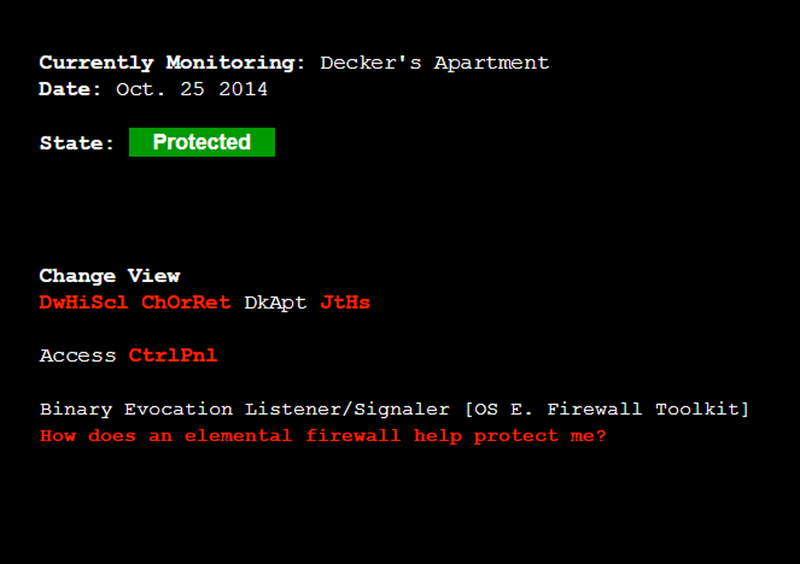 For example, BEL/S has the matter of "fire" and the motive of "order" — appropriate for a firewall program. Some spirits are malicious, while others just happen to bypass the network you protect. It’s up to you, first to deduce with what kind of spirit you’re dealing, which becomes the central gameplay mechanic of Open Sorcery, and then to determine whether you should eliminate the threat by destroying it — in the game’s terms, “cleansing it with fire” — or understand the spirit and what it's doing by communicating with it. Each choice has its own advantages, and this is where the RPG elements are incorporated. Destroying a spirit increases your power, which is necessary to have in order to stay alive and protect people, but communicating with a spirit allows you to learn its matter or motive, and this knowledge can be used in certain situations later. For example, by correctly answering a chaotic spirit’s riddles, you learn the motive of chaos, which can be used to discover still more matters or motives. Tying into the CYOA-style of Open Sorcery is not only the choice of whether you want to use violence or understanding to solve a problem, but how exactly you want to go about it. Each situation has a variety of dialogue choices, and even matters and motives, that you can use to solve it. These decisions can either strengthen or weaken your relationships with characters, and certain situations and unlockables require you to have a high relationship status with these characters. These choices also help determine one of the multiple endings for each playthrough. Since Open Sorcery is text-based, there are little graphics used, aside from a couple of visuals towards the end of each playthrough; nevertheless, the text delivers a lot of personality for each character through style and color coding. When they 'speak,' each character has their own color of text which fits in with who they are as a character and also with the vernacular of how they speak. Decker, a straightforward and left-brained character, has blue text and speaks with sophisticated grammar and punctuation, while Janet, a more passionate and empathetic character, has pink text and uses more slang and texting lingo. This design choice makes each character feels unique and alive, which further adds to the immersion in the Open Sorcery world. It’s not hard to make characters seems dull and lifeless when you can only use text, but Open Sorcery puts in the time and effort to engender realism. Being text-based, audio is quite minimal as well, but that’s to be expected. The sounds that are used contribute to the digital atmosphere of Open Sorcery, such as a computer booting up, scanning, and other beeps and boops. It’s not much, but it does harken back to those classic, early text games on computers. The most salient feature of Open Sorcery is the story. Yes, it’s an intriguing concept, with the combination of magic and technology, but it’s so much more than that. It deals with artificial life learning about humans, becoming sentient, and finding a purpose beyond what its original programming. It’s interesting to play as a machine trying to understand human emotions, like fear, love, and sadness, while still accomplishing its primary function; the progression of BEL/S enlightenment from machine to (almost) humanity is natural and believable. 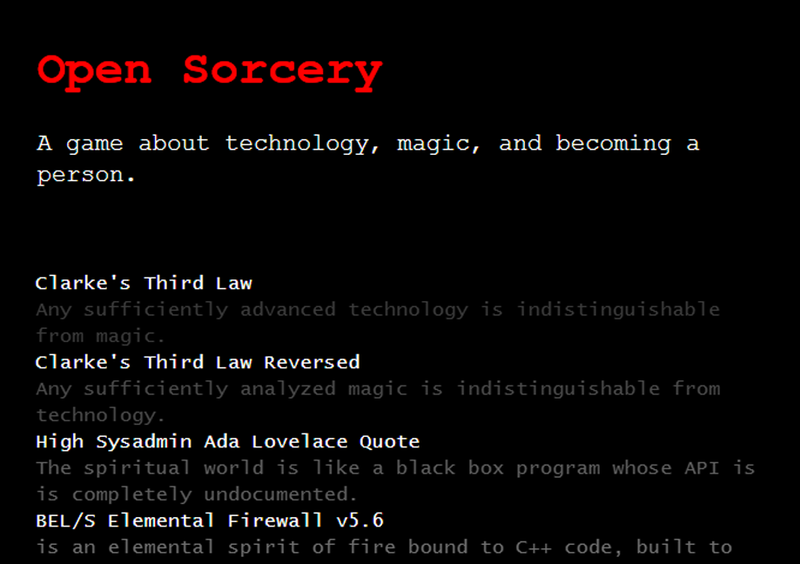 Despite these strengths though, Open Sorcery does have some flaws. To begin with, it's fairly short. My first playthrough lasted about an hour, and I was taking my time; subsequent playthroughs only lasted about thirty minutes or so. A fair portion of this time is spent waiting, though. Each time you click an option, it takes a few seconds to load to a new screen or piece of information. I understand this is intentional, as it mimics an actual computer, but it becomes tiresome to wait each time you want to advance in the story, especially if you’ve played it before and just want to try new options. Open Sorcery has great replay value because of its many dialogue choices and solutions to problems, but the waiting does diminish the excitement of a replay. Also, the save function is strangely implemented: there is no way to overwrite a saved game. The only way to save your game is to use an empty slot, or to delete a previously saved file to make room. This becomes repetitive when you have multiple saved games ready to try new options or attempt to unlock new things, but you have to delete them. Open Sorcery present fresh ideas and a great premise. The gameplay is fleshed out, and each character adds to the enjoyment of the story. There are even thought-provoking concepts and themes in the game, however, the amount of time and effort it takes to get through the title on following playthroughs and, the effort required to save your progress, diminishes its otherwise high replayability.